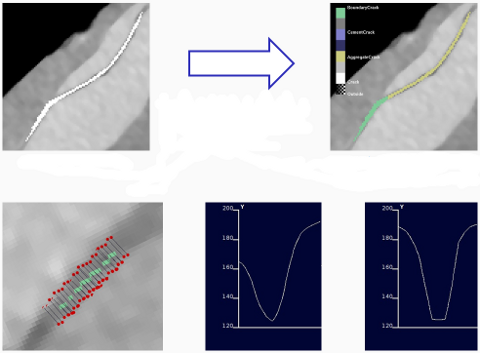 Non-destructive testing (NDT) method such as computer tomography (CT) are more and more used as imaging techniques to analyze the inner structure and to detect flaws in concrete specimen. In this project algorithms have been developed to find cracks automatically in CT images of concrete. The goal is to quantify damage processes in cementious material in space and time. Three different crack detection methods have been evaluated. The statistical evaluation of detected cracks and the tracking of single cracks over several frost-thaw cycles are future project goals. Analyzing damages at concrete structures due to physical, chemical and mechanical exposures need the application of innovative non-destructive testing (NDT) methods to trace spatial changes of microstructures. 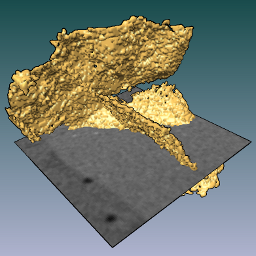 The images are obtained by 3D computer tomography with a very high resolution. This leads to data sets of more than 6 GB per concrete specimen. Three different crack detection methods for the analysis of computed tomograms of various cementitious building materials have been evaluated. Cracks are represented as a labelfield independent of the choosen detection method. One should also take memory consumption into account when assessing the methods. Here, template matching outreaches the Hessian-based methods since the latter may produce results which need up to 50 times the size of the input dataset (Eigenvalues and Eigenvectors). Whereas the memory consumption of template matching is increased by a factor of 4. Due to the lack of reference samples and standardized image quality evaluation procedures, the results have been compared with manually segmented reference data sets. A specific question is how automatic crack detection can be used for the quantitative characterization of damage processes, such as crack length and volume. The crack detection methods have been integrated to the scientific visualization system ZIBAmira that allows displaying the tomography images as well as presenting the results. This is in contrast to previously given statements, but new results obtained from new datasets and computations convinced us tho change our opinion. To assess the concrete quality not only the number and size of cracks is important but also the material the cracks run through. This is called the embedding of the cracks. The images below sketch how this is done by evaluating the crack profiles.